Lovely, crisp lettuce leaves - I like a combination of cos, butter, radicchio and rocket. Lots of avocado (I used 4 small ones for the two of us - perhaps a bit indulgent). I scoop it out with a teaspoon lately, instead of cutting it. 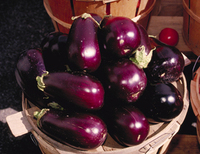 Aubergine - I used three medium sized, firm ones. Peel and cut them into slices of about 5mm thick, and then fry them in a little grapeseed oil until cooked and brown. Pancetta - as much as you like. Fry until crispy. Shake well, and drizzle over the salad. We enjoyed this with a bottle of Neethlingshof Gewurztraminer, which complimented this dish perfectly!